Policeman stabbed near Ramallah shows signs of improvement. Security guard stabbed at J'lem bus station remains in serious condition. The condition of the Border Policeman moderately wounded in a stabbing attack on Friday during Arab riots near the PA Arab city of Ramallah, north of Jerusalem, is improving, hospital officials said this morning. 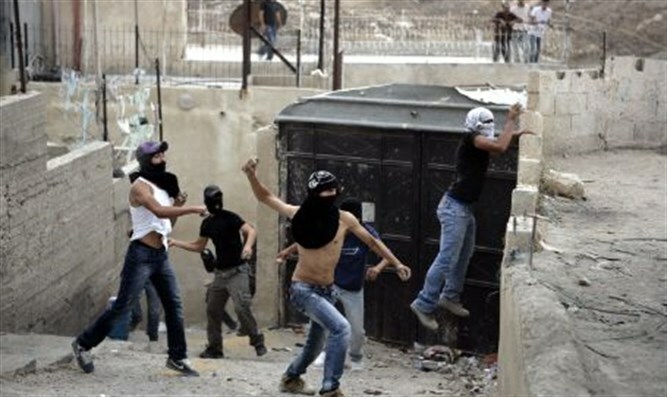 While Border Police are still investigating the circumstances of the incident on Friday, initial investigations indicate that the terrorist ran, holding a knife in his hand, towards Border Police who were dealing with riots along a road near Ramallah, and stabbed one of the policemen in the shoulder. The policemen shot the terrorist, neutralizing him. While footage of the terrorist shows that he had what appeared to be an explosive belt strapped to his body, an Arab Red Crescent ambulance evacuated him before security officials could verify whether the belt was explosive or not. According to Border Police, the terrorist disguised himself as a journalist before running up to the Border Police officer and stabbing him. Police who shot the terrorist following the stabbing, shot him a second time after noticing the apparent explosive device, fearing he would detonate it. According to Jerusalem’s Shaarei Tzedek Hospital, the wounded soldier underwent an operation on Friday, and is currently hospitalized, though he is not sedated nor on respiration. On the other hand, the hospital noted that the condition of Asher Elmaliach, the security guard at Jerusalem’s central bus station who was wounded in the heart in a stabbing attack last Sunday, continues to be serious. On Tuesday, officials at Shaarei Tzedek Hospital said that Elmaliach’s life was no longer in immediate danger. Nevertheless, they noted, his condition continued to be serious and he was still sedated. The hospital said this morning that Elmaliach has been connected to an ECMO (Extracorporeal membrane oxygenation) machine to assist his breathing.